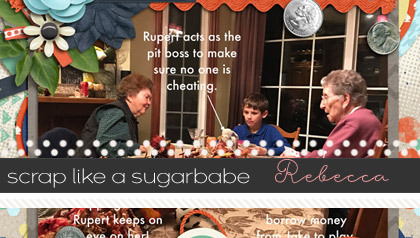 This week kicks off a special weekly focus on Sweet Shoppe’s newest Sugarbabes. First up is Crystal, known in the forum as crystalbella77. Her gallery is full of bright fun layouts that no matter how colorful or decorated they are they always look crisp and clear. Her pages have a heavy emphasis on storytelling and today she is going to give you some tips on adding your stories to your pages. Hey Everyone! I am Crystal and I so super excited to be one of the newest Sugarbabes! Once upon a time I was Babe, then life threw lots of major curveballs at me, and now I am so excited to be back. I have always missed the team! 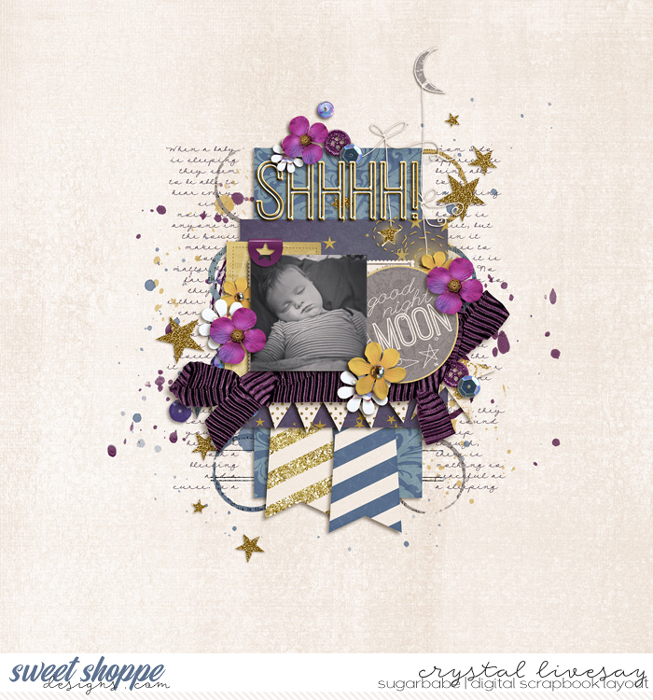 I have been digital scrapbooking for about 8 years now and love it so much. 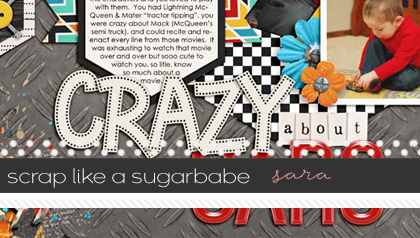 It’s the perfect medium for me to be creative and document our memories because I have little to no extra space for all kinds of crafting and that ctrl + z is a serious life saver! I live in rural Indiana with my sweet hubby of almost 14 years and our 4 kids and 2 cats. They are amazing and mean everything to me and they are why I scrapbook. Telling our stories, taking photos and just keeping a record of our lives is what is most important to me. That is why I almost always do some kind of journaling on my pages and that’s what I am going to talk to you about today! We are going to get a little creative with our journaling! 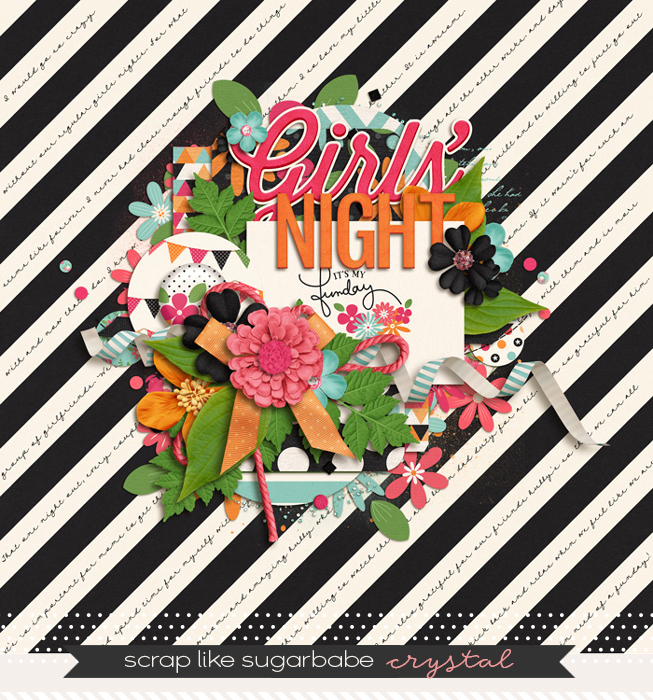 When I sit down to scrapbook, I always start with a kit and a story. Sometimes that doesn’t even include photos. However, I place my journaling last. Most of the time I choose papers and elements that I think will fit with my story and help me to be creative when placing my journaling. It’s easy to just throw on your journaling, and I do that a lot, but it’s fun to find something unique to do with it. On the page above, as soon as I saw that paper in the kit I KNEW I wanted to journal across it diagonally on those white stripes. 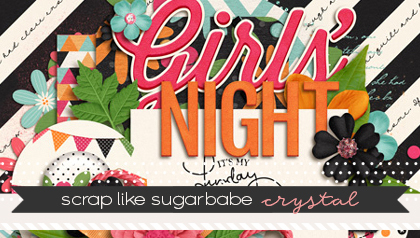 It fit with my “Girls’ Night” theme too which is about having fun and letting go! So I created my page like usual, working around my cluster and title and then I had some fun with my journaling. Another fun way to be creative when placing your journaling, is to put it in a shape. You don’t even need to outline it or use a paper. Using Photoshop Elements 11 (I know I know! I am behind the times! I have the cloud but it scares me ha!) open up a shape onto your page and do not simplify (rasterize in PS) it. 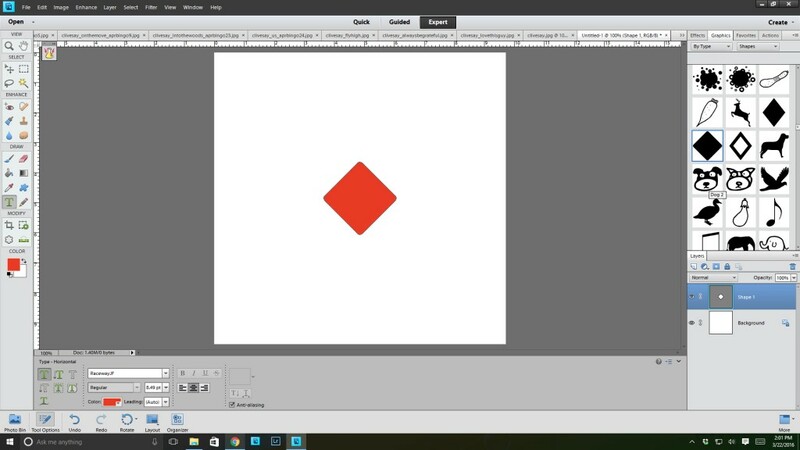 You can see the diamond shape in the layers palette. Keep it like that and click your text tool and make sure you click INSIDE the diamond and start typing. If you click ctrl + J it will make it all fit perfectly into your shape! 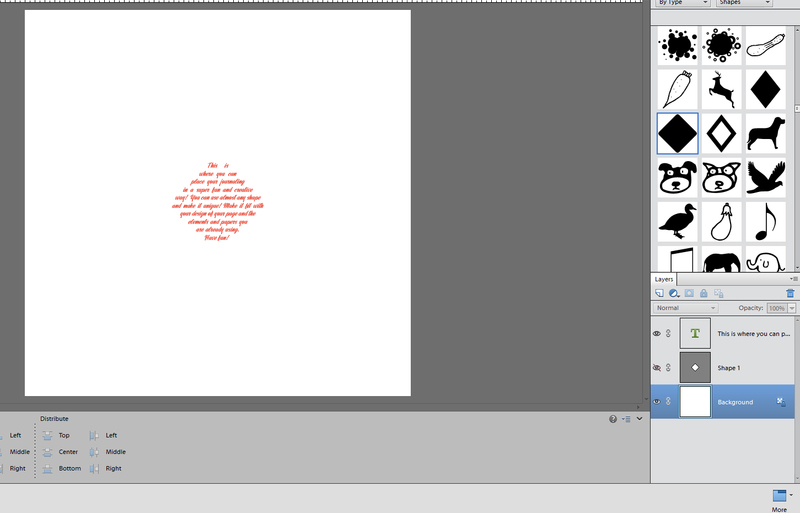 Then you can hide the diamond the layers palette and you have a super fun text shape! You can do that with MOST shapes in PSE, but not all, but have some fun with them and try! 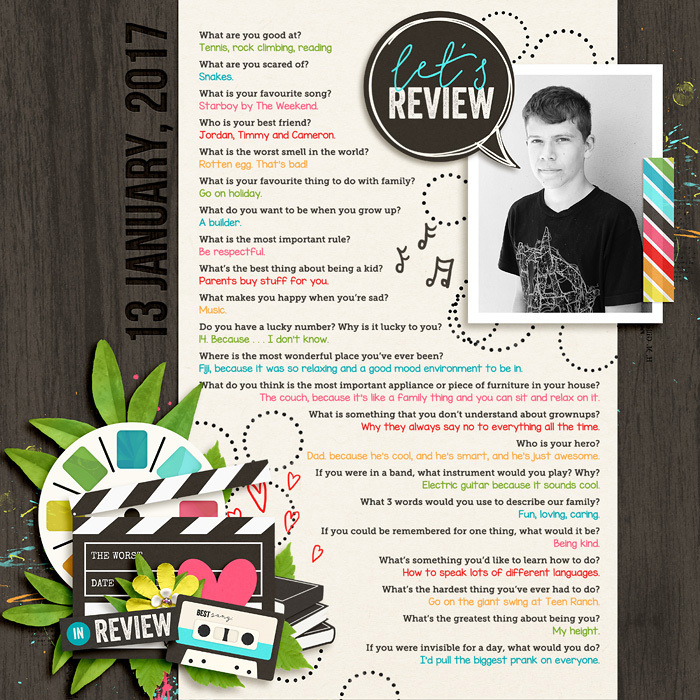 It is a super fun and easy way to make your pages a little more creative than just a regular old text box. You might be someone who wants your photos to tell your stories and I get it! Those sweet faces of your precious kids and family really say a lot and mean a lot! 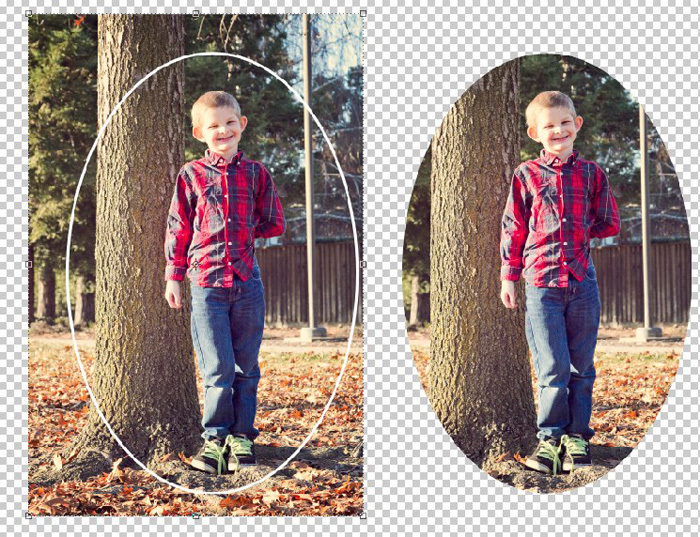 Put those photos great big on your page. Let it shine! Then….make it a wee bit more personal and journal right on top of it. It does not detract from the photo at all and gives it such a sweet touch. Your words and story are unique and special and worth getting out there. Even if you don’t share exactly what it says, don’t be afraid to put it out there. 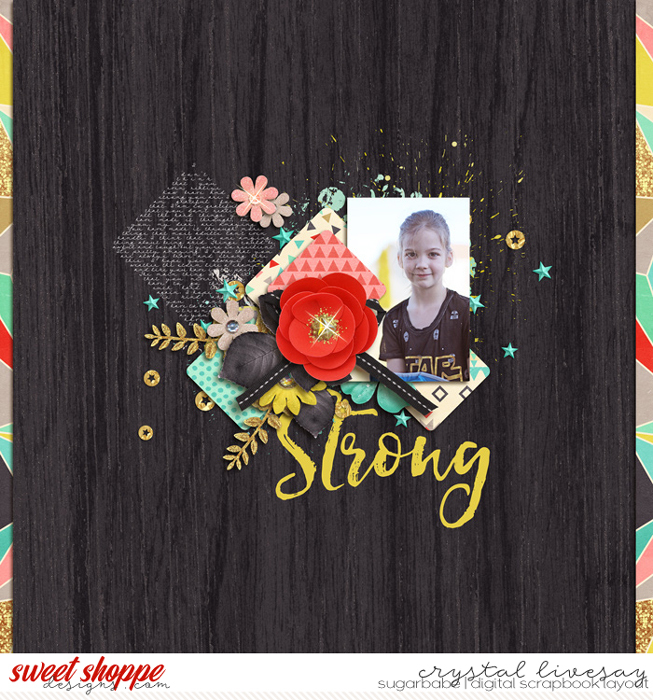 You can also use your journaling to frame your photo and/or cluster on your page. This is a really great way to keep those photos the focus if you are someone (like me) who doesn’t always share all of my exact words with the world. I know what it says, and when printed you can read it, but in the galleries and social media, you can see I told a story, but my photo here is what you notice most of all. Plus, when you are willing to break up your journaling in more than one place, it gives your page such great balance! I hate when it feels “heavy” so to speak on one side. Breaking it up spreads the “weight” around. You can do more than one of these things as well! You can use your paper as your guide and space it out like I did here. This page has super nice balance and in general would just be a regular clustery page, but when my creative journaling it gives it just that wee bit of something extra special I think! This page I used the spreading it around and journaling in a shape to make it more creative. This kit came with those super fun hexagon stitches and I knew I wanted to highlight that shape a little bit so I made paper shapes and journaled in hex shapes. I hope that these inspired you to give journaling in a creative way a shot! You have a story to tell so don’t be afraid of it!! Have some fun and find some techniques that might work for you and let your papers and elements guide you a little bit. The possibilities are endless! 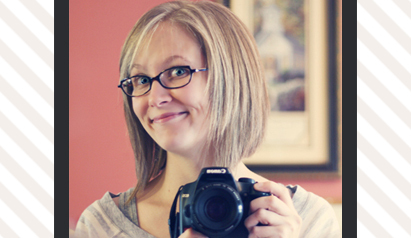 I love the idea of journaling in a “shape” – I have to try it – thanks for sharing.